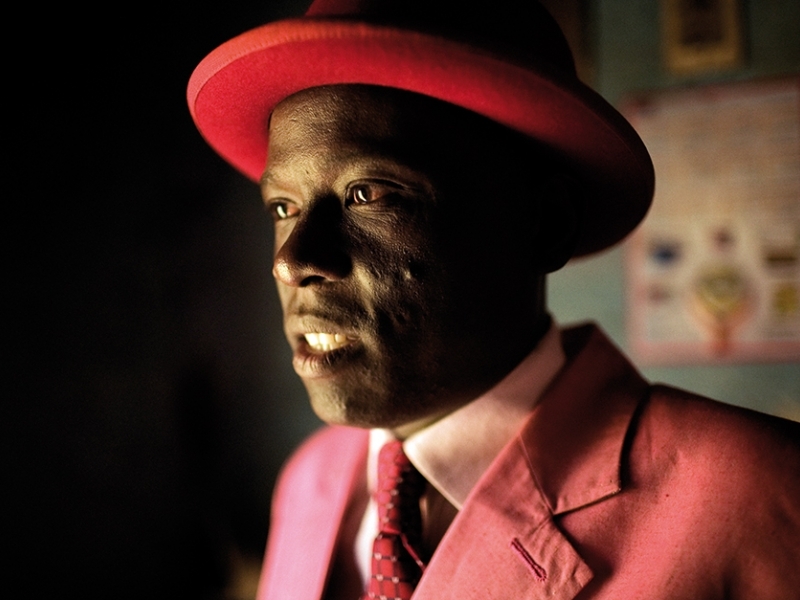 SAPEURS: A DREAM OF A RETURN JOURNEY. Sandra Maunac and Mónica Santos talk in their essay about THE SAPE, The Society of a curious and flamboyant movement formed principally of youths from the city of Brazzaville, capital of the Republic of the Congo, and also some from Kinshasa, capital of the Democratic Republic of the Congo. The movement, whose birth dates back to the 1920s, at the height of the colonial period, is currently acquiring an unprecedented importance both in the Republic of the Congo and beyond the borders of the African continent itself, becoming an object of imitation, study and exhibition. A clear perspective of this fascinating movement, rich in both visual and ideological meaning, can be found in the work of Héctor Mediavilla and Baudouin Mouanda. A DREAM OF A RETURN JOURNEY. 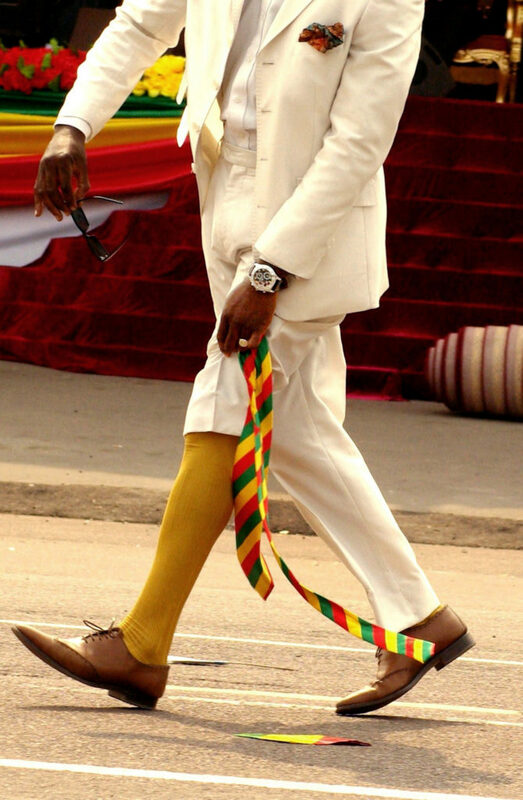 THE CONGOLESE SAPE. Hector Mediavelle: Willy Covarie with a-bottle of red wine, 2008. This Proustian phrase encapsulates to perfection one of the teachings brought to us by the SAPE —la Société des Ambianceurs et Personnes Élégantes, or The Society of “Atmosphere” Setters and Elegant People—, a curious and flamboyant movement formed principally of youths from the city of Brazzaville, capital of the Republic of the Congo, and also some from Kinshasa, capital of the Democratic Republic of the Congo. The movement, whose birth dates back to the 1920s, at the height of the colonial period, is currently acquiring an unprecedented importance both in the Republic of the Congo and beyond the borders of the African continent itself, becoming an object of imitation, study and exhibition. A clear perspective of this fascinating movement, rich in both visual and ideological meaning, can be found in the work of Héctor Mediavilla and Baudouin Mouanda. 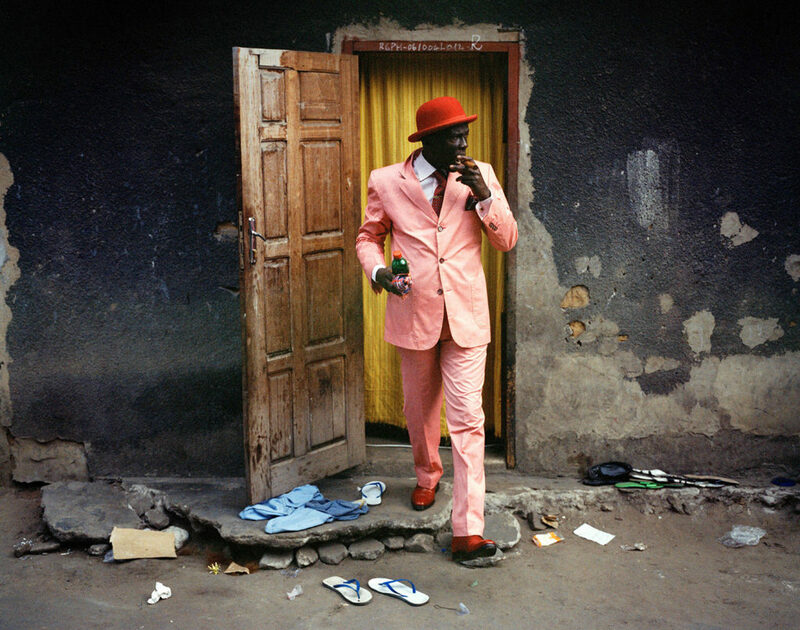 The two photographers, the former Spanish and the latter Congolese, contrast their visions; one, as an external observer, investigates the psychological and social complexity of the SAPE invoking a dreamlike, poetic and romantic reality in which sapeurs -as practitioners and followers of this art are known- seem to dream their lives. The other one, insider of the situation of his fellow country people, presents a dynamic and creative rendering, highlighting the theatrical and exhibitionist side of the phenomenon, and pictures dandies living in a dream. But above all, both of them challenge the collective image of Africa and its peoples, through the SAPE, our prejudices are called into question. On the one hand, Mediavilla and Mouanda lead us to a deeper knowledge of the rules and prescriptions of these youths. On the other hand, and most importantly, they compel us to journey to the world of their dreams and to understand the nature of the cult they practise, impregnated with its own philosophy. We see that they carry an implicit message of resistance and struggle to undermine the social status they hold, firstly within their own community, country and other African countries, as well as our own Westernised unwavering and impassive view. The SAPE – term whose roots lie in the colloquial French expression “se saper” used to refer to somebody who dresses elegantly – is a veritable show. Some would say it is an art, others would say it is a cult, a cult to appearance where brilliant and impertinent elegance is not to be improvised,2 where all is encoded: from the tone and colour of the suit with their own symbology, to the label one wears and has chosen for the occasion. Some hail it as an actual religion within which luxury labels become divinities and their designers patron saints. In reality, these youths draw their inspiration from a tradition which spans back to the pre-colonial era and which city life has merely consolidated. It consists in the use of the symbolic power of the garment and of the significance of dress as a mediator in relations of identity and within society as a whole.3 However, the item of clothing in itself is not enough. Aside from the label of the suit and the equally important accessories, creativity and individual genius in knowing how to dress and carry oneself are paramount. 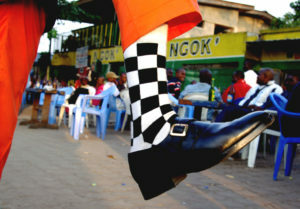 These are things that cannot be purchased: gestures, mimicry, poses, dance steps, gait and saunter all form part of the repertoire of the Sapeurs. In this way a theatre set of vivid colours, movement and surprise is staged, and this is captured in the photography of Mouanda. When on this stage, not only does the clothing shine with the power to transform its wearer, but also this performer must know how to sell himself and challenge his rivals. These challenges culminate not in violence, but in the use of the word; a language with its own vocabulary and subtleties, although always in the local tongue. Thus elegance is not the sole criterion in aspiring to the title of sapeur. A sapeur is above all else a gentleman and a pacifist. And so the SAPE expresses itself as a life style from whose tenets new references and behavioural codes are formed4, founded on non-violence, hygiene, self-respect and joie de vivre. It is a model which is a vehicle for them to claim their right to decide their own destiny and fight for their happiness. In order to reach this, the sapeur must not only assume these rules and respect these codes, but must also undergo a process of transformation fulfilling one of his greatest dreams: to travel to Paris. The sapeur becomes complete through pilgrimage to the Mecca of elegance, as the myth of the French capital continues to fuel the collective imagination of these post-colonial subjects. The expression of this myth remains within the same parameters as in colonial times and is constantly fed by the rewritten and reinvented adventures in the tales that these sapeurs bring back with them on return to their country. So it all began in 1922 with the return from Paris of Grenard André Matsoua, dressed according to the principles of French elegance. It was he who marked the starting point of a modern expression that is the fruit of intertwined, superimposed and interconnected tales of the Empire. This can also be observed in the adventure of Lamane, the so-called “Old Parisian”, who Mediavilla accompanied both in the Congo and on his first trip to Paris. The universe of this sapeur, from its most intimate and secret aspects to its most public and exhibitionist, is related to us in the photographs with attention to detail and delicacy. In this way, in order to fulfil himself the sapeur must embark upon a journey of initiation into his inner self5, one that is ridden with obstacles, sacrifices and hardship which will all be concealed so that the dream survives. Despite the conditions of the journey having varied across the years, they have always been complex, although today they are even more so. This is so not only due to the difficulty in obtaining a visa and flight, but also in managing to subsist in a foreign country with no papers and faced with increasingly restrictive and repressive legislation. Yet in spite of all of this, the sapeur’s aspirations do not falter at the prospect of adversity. He knows that he must embrace the adventure and that under no circumstances must he fail. This is because, unlike the other so-called “economic” African emigrants with whom they do not mix and from whom they try to distinguish themselves, the sapeurs are undertaking a cultural emigration. It is an emigration with the aim of constructing one’s identity and its movement is circular in that its objective is that of returning, not of remaining. 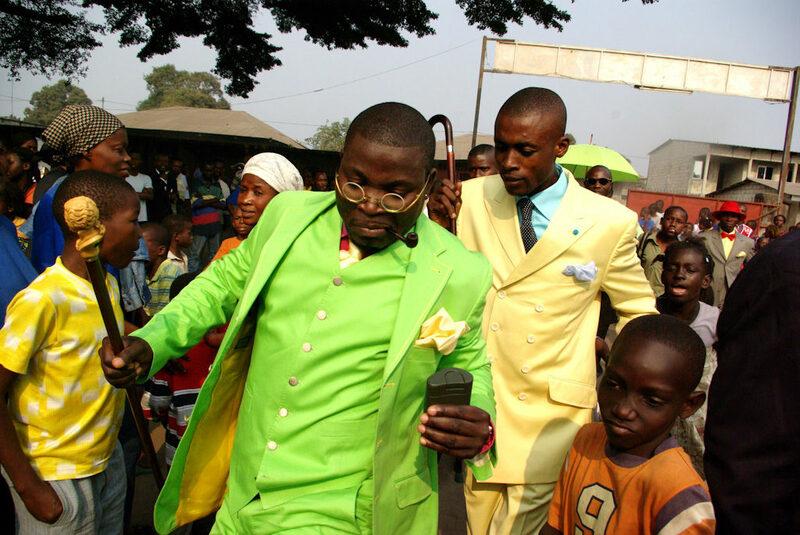 In order to become true sapeurs they must procure the necessary garments to then enact the triumphant “descent”—la descente, in their own vocabulary— into their own country. Thus the aspiring sapeur undergoes a process of examination in Paris, but he will only be ordained with the title of aristocrat of elegance in his own country before his peers. And so the need for recognition is constant and indispensable in that it is the only way in which this success, or prestige will benefit not only oneself, but also one’s family and community. The sapeur has set forth in order to shine and to be seen in a majestic light and, this being so, failure is unthinkable, the dream is not be shaken and detractors who may break the myth are to be negated. Through the purchase of clothing which many could not afford even in their wildest dreams, the sapeurs conceal their social origin and transform it into a victory through an image of prosperity and social success. This image carries a message: the rejection of poverty, the same poverty to which they are wished to be confined, and the reassertion of an identity which demands a status in accordance with their value system. Thus the SAPE constitutes a form of resistance8 through the development of a culture which rises in opposition to the models imposed by the political authorities in both countries of the Congo. For three decades, in Mobutu’s Zaire it was obligatory to wear traditional African dress, the famous abacost —which means à bas le costume (down with the suit)—, while the socialist Congo imposed a standardising dress. In both cases the European model was rejected. At that time the SAPE was a marginalized movement, condemned by the political authorities who deemed the followers of these practices delinquents and opponents of the model they wished to impose. However, instead of being wiped out and, of course, due also to the socio-political context of both countries, the sapeurs have succeeded in consolidating a role which currently fulfils a fundamental social and cultural function left vacant by the State. Besides offering a model of self improvement and identity to a youth group that is immersed in a disheartening reality and social inheritance out of their control, they offer leisure and smiles, distancing a whole population from violence9 and reducing social barriers. The sapeurs have succeeded in making this rebellion something that is manifested today as one more expression of present day globalisation. It should not to be forgotten that the population of the Congo has suffered three consecutive civil wars in recent years. From this stems the demand to the right to dream and to forget. This is only offered to them by the SAPE. Today the sapeurs invade public spaces, appearing in the most frequented areas and animating popular celebrations such as weddings, festivities, funerals and parading each year on the 15th August for the National Festival. What is more, they gather together in weekly meetings or particular bars where they go to be seen but, above all, where they mingle. Although the sapeur’s exhibition is in effect competitive, individuals attempt to set themselves apart from others with a repertoire of characteristic gestures or a flamboyant name, and although each one may come from a different neighbourhood, in the end they all join together in a display of mutual respect and admiration. This favours reconciliation among a population which has suffered a war that at one time wanted to drive them apart. Hector Mediavilla, Bienvenu Mouzieto and the blue wall 2004. Employees and employers, young and old, traders and military men all join together to the rhythm of festive music10, where both local sapeurs and expatriates parade themselves and challenge each other causing pre-existing social barriers to vanish. However, the SAPE is not restricted to popular culture, but rather is both accepted and legitimized today by the very political authorities who condemned it years ago. In fact the current president of the SAPE is Minister of Communication and President Denis Sassou-Nguesso is considered a true sapeur and is known within the SAPE as the “Communist Cardin”. With this in mind, it is evident that the SAPE is no longer a marginal phenomenon. This raises the question of whether there is not a danger that it should be absorbed and that, like any other resistance movement, it may lose its force on being assimilated by the powers that be and see itself reduced to a mere fashion. These questions are particularly pertinent taking into account the fact that the SAPE is observed to be extending beyond its own borders. Today prestigious Western fashion designers are inspired by the SAPE in designing their collections, such as Paul Smith’s summer collection of 2010. Both national and foreign sociologists and novelists are investigating this phenomenon, drawing from it and pondering the repercussions it may have on the present day. However, and most importantly, for the first time there is not only a representation of this phenomenon through the medium of photography, but there are also subsequent exhibitions of it in contexts that are wholly divergent from that of its origin. Yet could the act of modifying the Sape be its death-knell ? There is without doubt a risk, but it is one that is worth taking because the SAPE succeeds in offering us a fundamental lesson: we all have the right to dream. This is what is achieved every day by the sapeurs in constructing a life of dreams, a life which at times they live in a wakened state and at others through closed eyes. 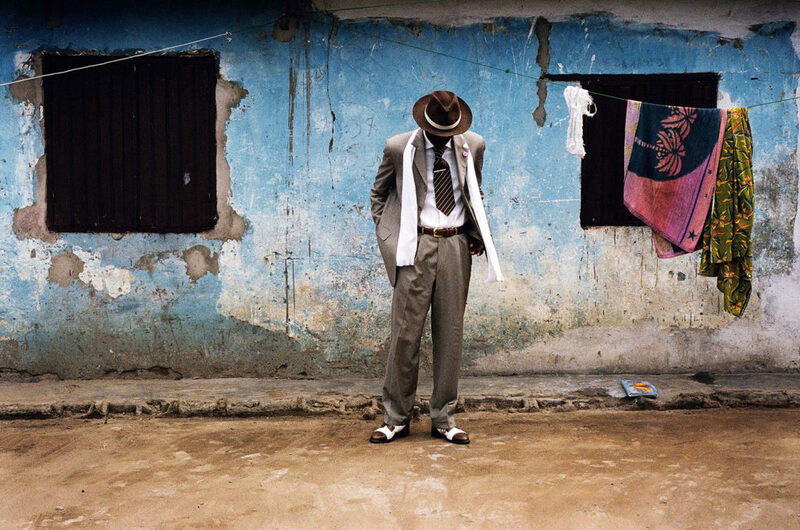 Photo homepage: Baudouin Mouanda, Untitled, 2009. 2 KAMENEDD, Marion; La sape ou l’élegance pour religion. 3 THOMAS, Dominic (2003) Op. cit. p. 955. <http://www.afriquechos.ch/spip.php?article2213>( consulted on 9th August, 2010). 5 THOMAS, Dominic (2003) Op. cit. p 963. 6 CHUKWUDI EZE, Emmanuel (2001) Pensamiento Africano: Filosofía. Bellatera, Barcelona. p 97. 7 DEVEY, Muriel (2007) Op. cit. 8 THOMAS, Dominic (2003) Op. cit. p 957-958. 9 DEVEY, Muriel (2007) Op. cit. 10 KAMENEDD, Marion, Op. cit.